Date is exactly "1904 March 18"
Beth Hibben writes Jessie Wilson Sayre from Princeton on Jessie's trip to Italy. 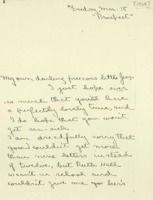 Mary Margaret Fine writes Jessie Wilson Sayre from Princeton on Jessie's trip to Italy. Eleanor Wilson McAdoo writes Jessie Wilson Sayre on Jessie's trip to Italy.